VroomVroomVroom can help you find a car rental that will suit your budget and needs. We compare deals from Australia's major brands including Avis, Budget, Thrifty, Enterprise, Europcar and Hertz. So if you want to know what the best car hire deals at Gold Coast Airport are when you arrive, we will show you. It's that simple. Enjoy great rates! 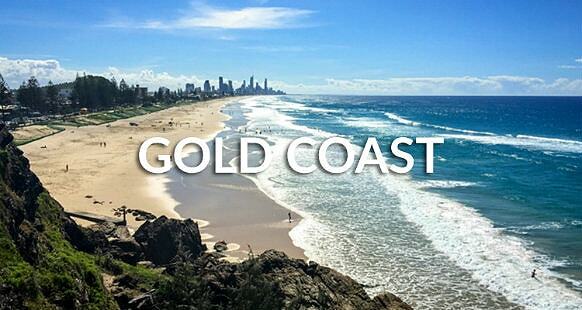 Gold Coast is known for its sunny weather, surfing beaches, lush rainforest hinterland and exciting theme parks. It is the second biggest region in Queensland, located just south of Brisbane. Visitors have access to public transportation on the Gold Coast, but renting a car through us allows you to explore some of the beautiful surrounding areas. Why rent a car at the Gold Coast with VroomVroomVroom? Convenience - If following bus timetables and searching for connecting trains does not sound convenient, consider a rental car for the freedom to travel where and when you want. There is ample parking available at the Gold Coast. Comfort - A car rental provides complete comfort for your holiday so you don't have to share buses with other holidaymakers. Great rates - If you are planning to explore the region, it is often cheaper to hire a car than spend money on public transportation. We have negotiated with our car rental partners so we can provide the best price. Read our Price Promise for more details. Wide selection of vehicles - Aside from the numerous car rental options, we also compare campervan hire deals on the Gold Coast. Trusted since 2001 - We have been helping people book the perfect rental car for more than a decade so let us help you as well. Contact us by phone, email, live-chat, or through any of our social media channels. The Gold Coast is a summer favourite among Australians and international travellers. December, January and February are the warmest months, and the coast is sure to be busy during this time. When visiting the area during winter temperatures may be slightly cooler if you travel into the hinterland region. The Gold Coast plays host to many international events. In April next year athletes from around the world will arrive for the Commonwealth Games. Motor enthusiasts visit the coast in October for the Gold Coast 600, a famous race through the streets of Surfers Paradise. The area is also busy during late November for the annual Schoolies Week, with students from around the country arriving to celebrate their graduation. There is never a dull moment on the Gold Coast! If you are driving around the wider region there are frequent towns with services available, however it is still recommended that you take water with you. Mobile phone service may not be available in some areas, especially at Mount Tamborine and the mountains on the New South Wales border. Stay alert on back roads, even if there is not many other vehicles. For more useful driving tips in Gold Coast, click here​. Flying from Gold Coast Airport? For a great place to park your car, take a look at the range of parking options available at Gold Coast Airport. You can book a secure and safe place to leave your car while you are away, right here at Gold Coast Airport. Gold Coast has a reputation of a major tourist destination because of its sunny subtropical climate, surfing beaches, canal and waterway systems, its high-rise dominated skyline, nightlife and, last but not the least, its rainforest hinterland. Make sure to get your Gold Coast holiday off to a wonderful start by renting a reliable car hire in advance. To help you achieve the ultimate Gold Coast adventure, we at VroomVroomVroom have come up with a list of things that you can do and places where you can stay. There's more to the Gold Coast than just riding the waves, you can also learn more about surfing by visiting Surf World. 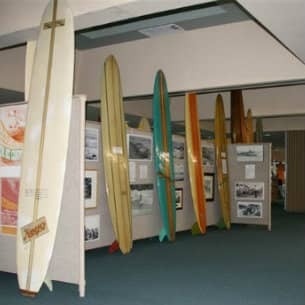 This is the only surfing heritage and beach culture museum in Queensland. Get a glimpse of how surfboards evolved through the years by checking out its exhibitions, which consist of more than 150 surfboards, iconic surf images, rare memorabilia and iPad interviews with surfing legends. Get ready to be amazed! Ripley's Surfers Paradise, which features 15 themed galleries that showcase all kinds of oddities, illusions, mysteries, and amazing stories. You will find things that can't be seen anywhere else, such as real shrunken heads and rare dinosaur eggs. After an unforgettable trip to the Odditorium, why not try the Laser Race Challenge? Let's see if you can navigate through a web of lasers just like what Tom Cruise did in “Mission Impossible”. Looking for the ultimate mini-golf challenge in the heart of Surfers Paradise? Make sure to check out King Tutt's Putt Putt, which can now also be found in the Carrara Markets. The putt putt course in the Surfers Paradise features glow-in-the-dark caves and Ancient Egypt setting as well as King Kong and ferocious dinosaurs replicas. The Carrara Markets location, on the other hand, will take you on an incredible journey through time at Pirate Cove, Dinosaurs, and Medieval Times and gives you a glimpse of the Asian Ruins of Cambodia. Experience a magical setting when you stroll along the Tamborine Rainforest Skywalk, which is surrounded by lush trees, breathtaking fauna, tumbling creek, and impressive rockpools. The new eco-adventure attraction allows visitors to explore the Tamborine Mountain in a different way. 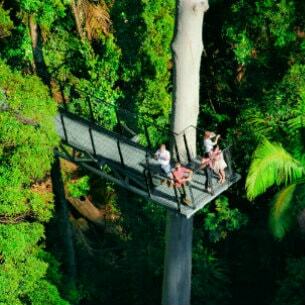 The Skywalk is the longest canopy walk in South East Queensland with a measurement of 300 meters. Nature lovers will surely enjoy the 50-minute walk to paradise. Nature meets adventure at Thunderbird Park on Tamborine Mountain. Come for the day or stay and play. Adventures include fossicking for treasure filled thundereggs, laser skirmish in a jungle village and the Tree Top Challenge high ropes course. Try the new SkyFall and drop 11 metres to the ground. Ride a FreeGo electric bike through the rainforest or take in the scenery on horseback. Activities are suitable for most age groups and fun for all the family. Thunderbird Park shares a 112 hectare rainforest property with Cedar Creek Lodges. It's perfect for a romantic break or a family holiday. Choose a shaded campsite, a contemporary room or a two bedroom private lodge. Most holiday packages include a big barbecue breakfast with the birds. Rooms and lodges have self catering facilities. Light meals, snacks and drinks are available on Thunderbird Terrace and the licensed on site Rainforest Restaurant serves breakfast and dinner daily. If you're looking for a place to unwind and relax, then the best place to stay is at the Mercure Gold Coast Resort. This beautiful resort is just a few minutes away from the pristine beaches, fun theme parks, Currumbin Wildlife Sanctuary, and numerous shopping destinations. Mercure Gold Coast features 280 rooms with its own balcony, courtyard or patio. There are also interconnecting rooms for those staying in large groups. All rooms are equipped with modern amenities to make your stay more comfortable. Theme Parks - With 4 major theme parks in the city, you will be sure to find one that suits you and your family. There's not just awesome rides and fun filled activities to enjoy, you can also participate in educational shows and see wildlife upfront and personal. Choose from Wet'n'Wild, Dreamworld, Movieworld and Seaworld. With plenty of parking, you are sure to find good parking for the day. Beaches - You can't go to the Gold Coast without spending a day at the beach. No matter what month you are there, the weather should still permit you to have a great day at the beach. The best part about a day at the beach is that it's free. Once again, there is a heap of street parking along the coastline so don't stress about where to park your rental car. Richard at VroomVroomVroom strongly recommends that all tourists Go Ride a Wave with a surfing lesson at Surfers Paradise. They are very accomodating to beginners and very friendly. They are also the most popular spot for surf board hire. It is important to be prepared so check out Boardcave for the best Surfboards and Surf Hardware deals. Shop until you absolutely drop - Being a very popular tourist destination means Bargains! Bargains! Bargains! With so many shopping malls sprawled throughout the metropolitan area, you will definitely find one that you will LOVE. If you are a bit of a shopaholic be sure to book a rental car with plenty of trunk space. Gold Coast Hinterland - Even though the coastline is so inviting and the white sandy beaches are hard to pass up, most days of the year, take your rental car and drive inland to see lush green pastures and tree lined roads. Its a great way to escape the hustle and bustle of the tourist strip without having to drive too far. You can even enjoy pristine waterfalls where locals like to swim. Just enjoy our hotel - Depending on where your staying, you can opt to just stay put and enjoy the luxuries that come with being in a hotel environment. Some even have Kids Clubs so the kids are taken care of. If you are not sure what to do after reading our tips, we are sure that once you arrive and collect your car hire, you will find that you end up running out of time, as the attractions on the Gold Coast are endless. Feedback: Great, quick, easy to navigate booking! Feedback: Pick up location is right under our hotel, which is great!!! Price is also great.